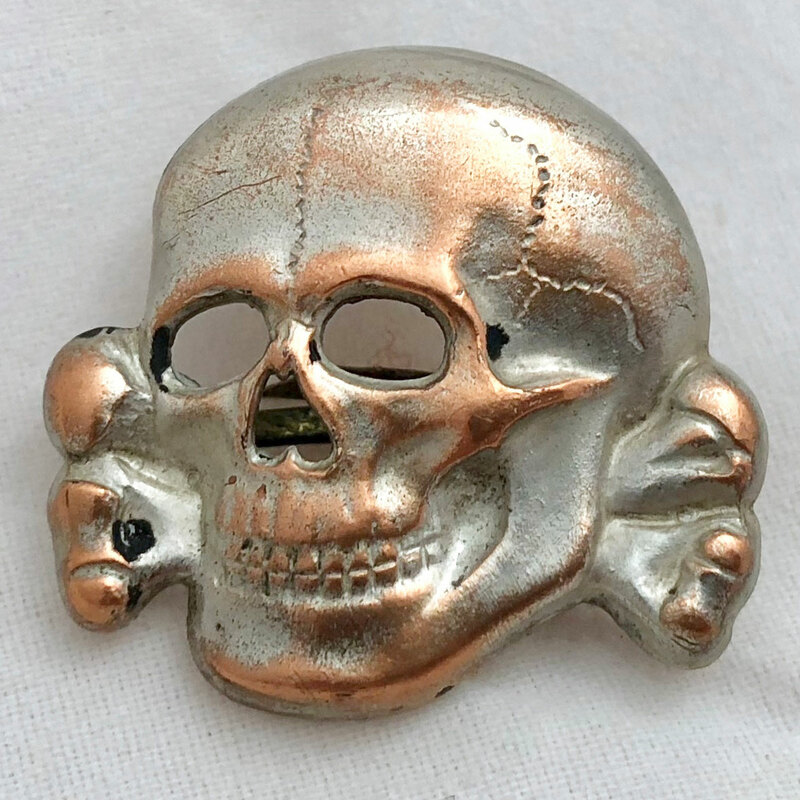 This is a mint set of 6 uncut BeVo World War 2 German SS Tropical Cap Skulls. 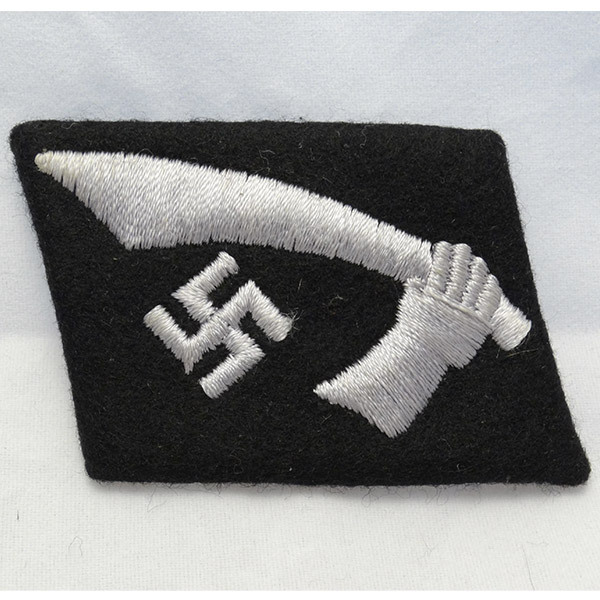 Completely flawless, this set came with an SS Panzer Grenadier Westland Cuff Title in equally pristine condition. 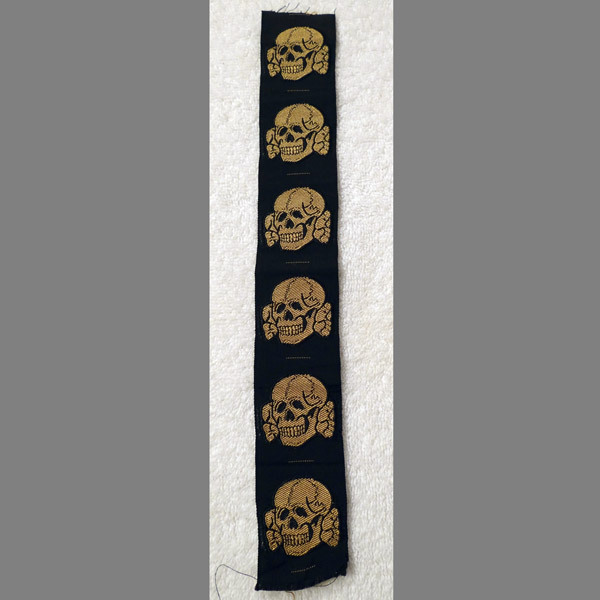 As shown in the photos, these skulls are correct in stitching, and completely in-tact with no stitching flaws to note. 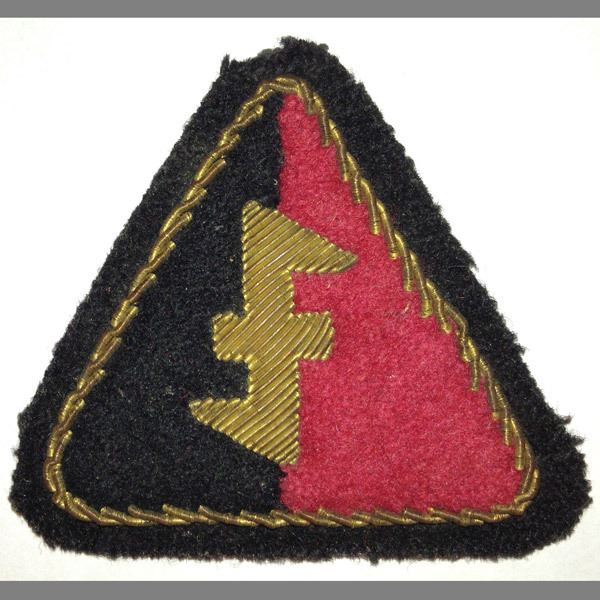 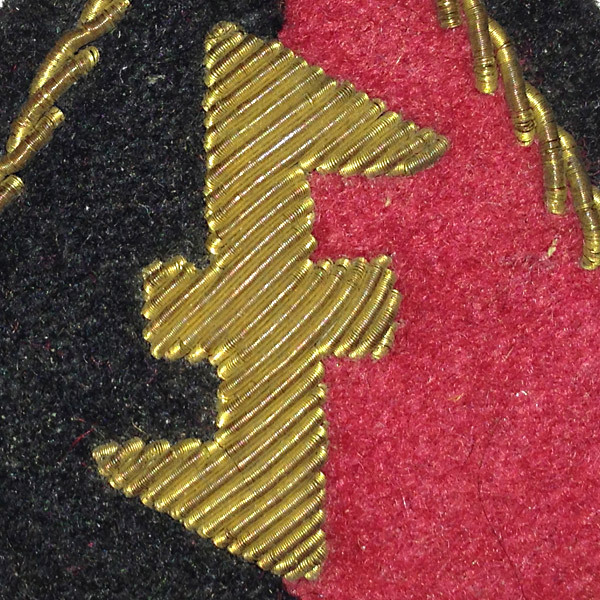 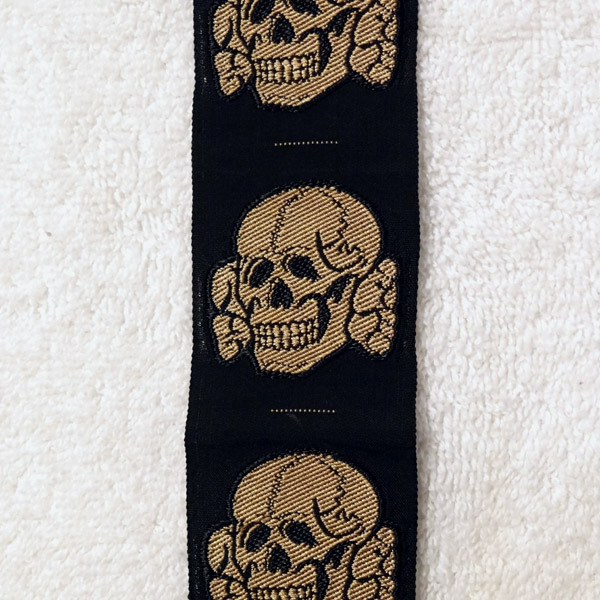 All SS cap insignia lay flat except the last one in the strip, which has a very soft crease across the lower left portion of the jawbone. 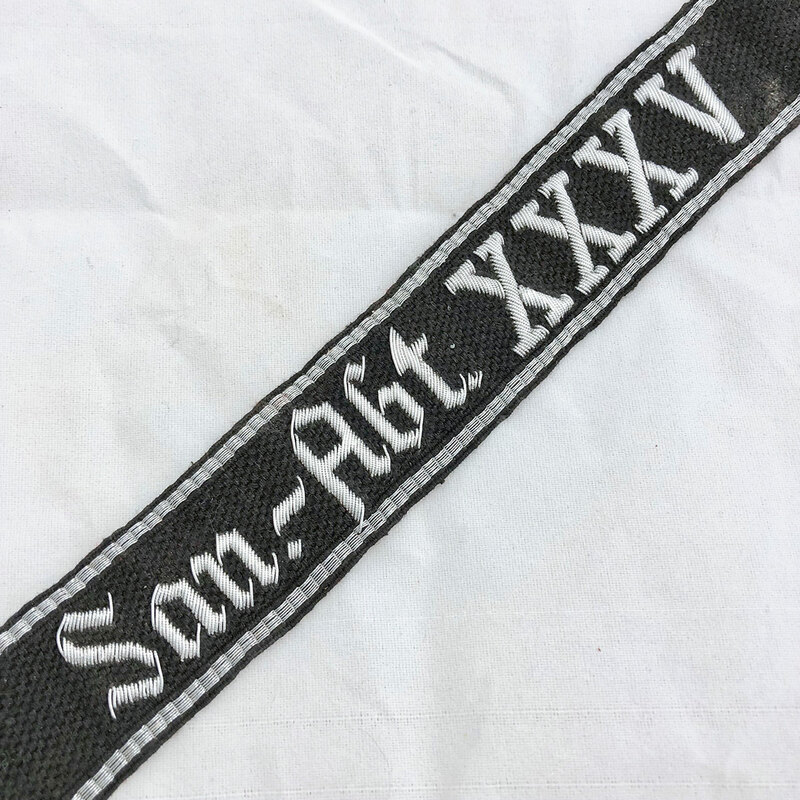 This is as good a set as you’re going to find! 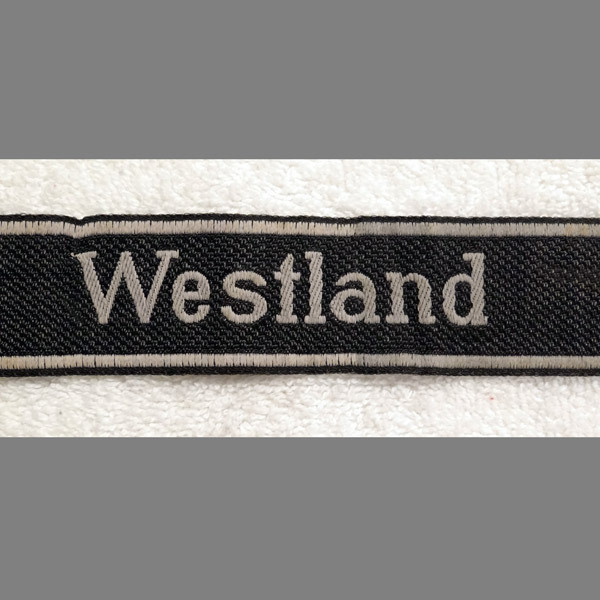 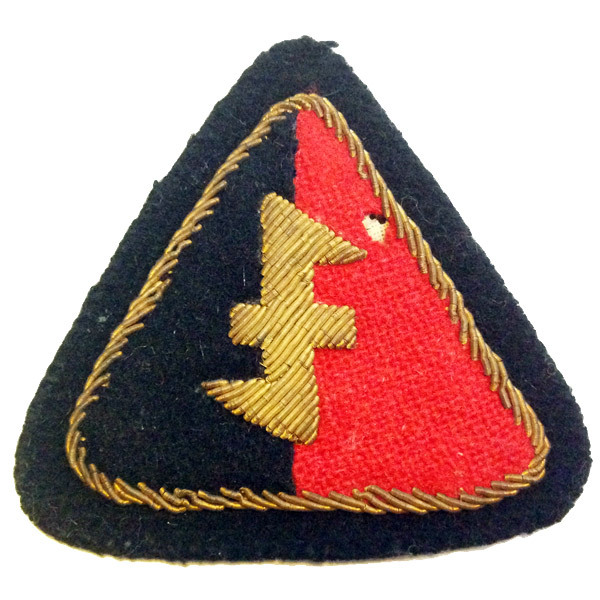 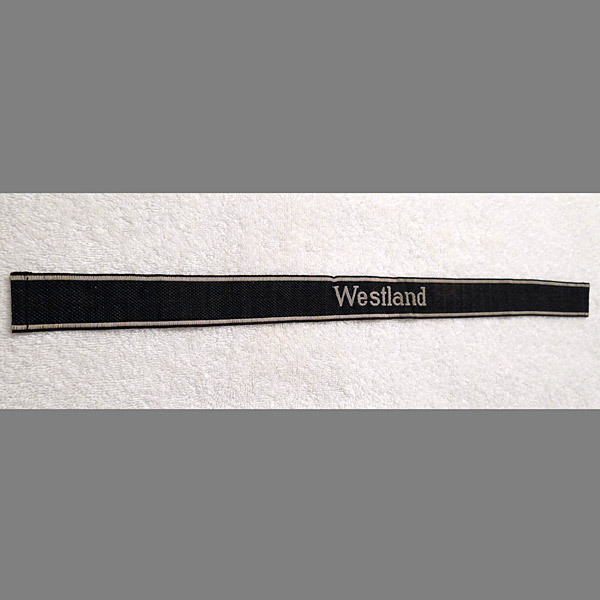 A near-mint example of a WWII BeVo Wuppertal style Westland Cuff Title for the SS Panzer Grenadier Regiment 10. 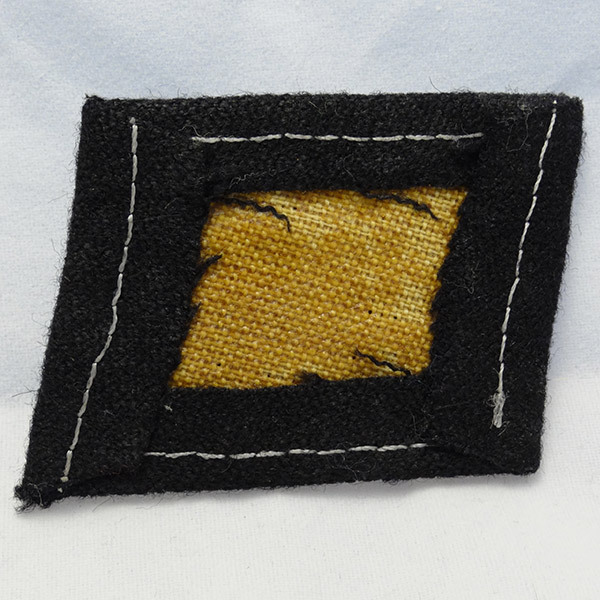 The stitching is perfect with no notable flaws whatsoever. 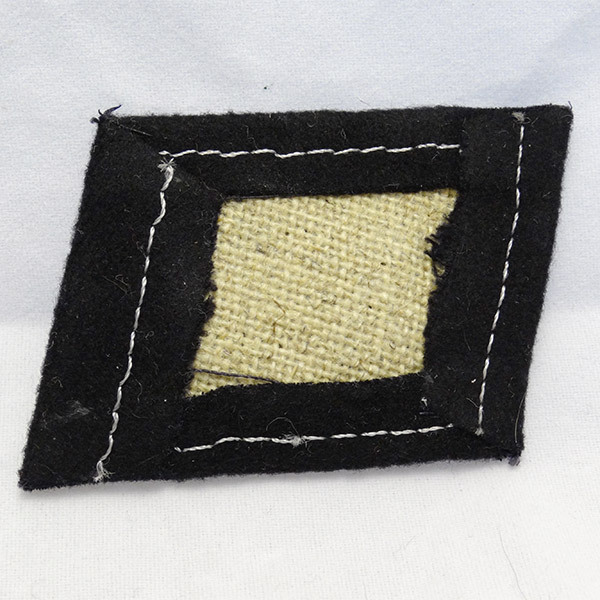 The ends are completely in-tact (usually found cut), properly tucked and stitched. 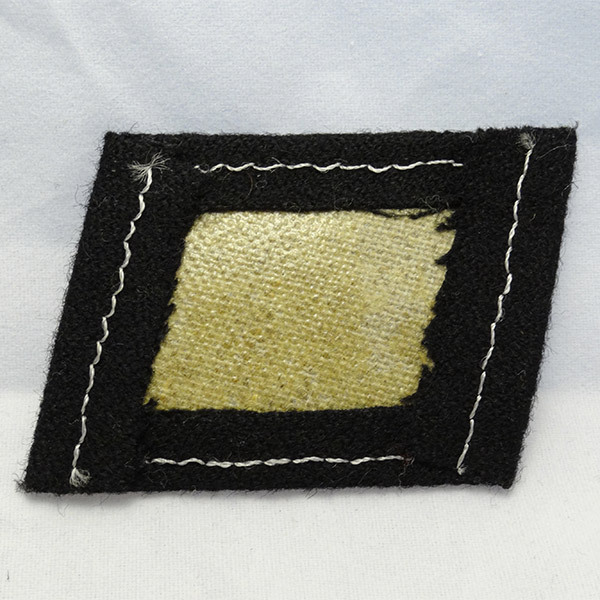 One of the ends clearly shows the “BEVO WUPPERTAL” words stitched into the fabric, something I’ve never seen in any other example; the words are usually hidden within the tucked portion of the fabrick. 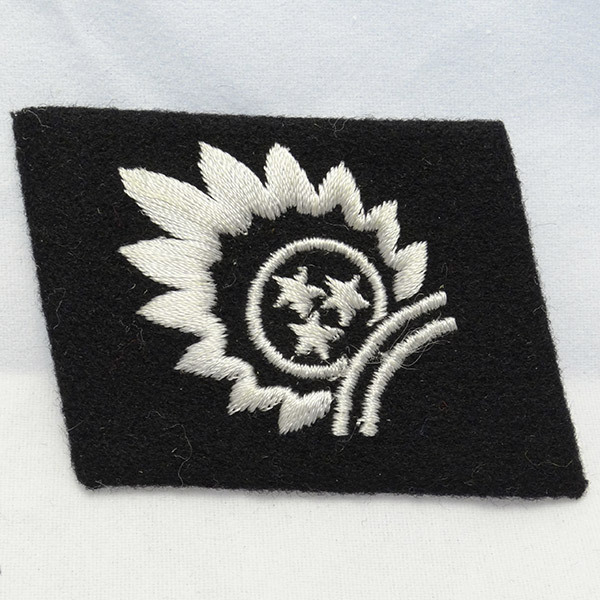 This is as good as it gets! 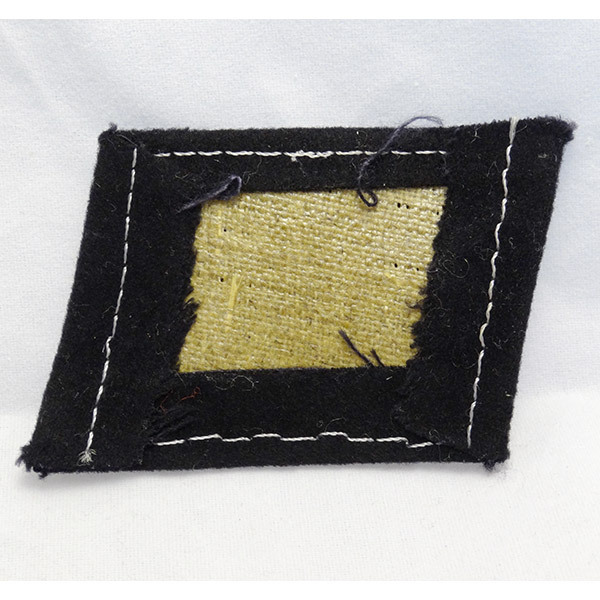 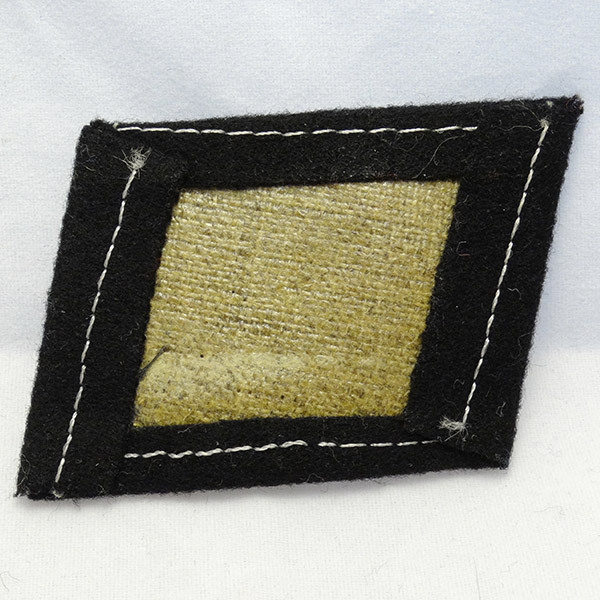 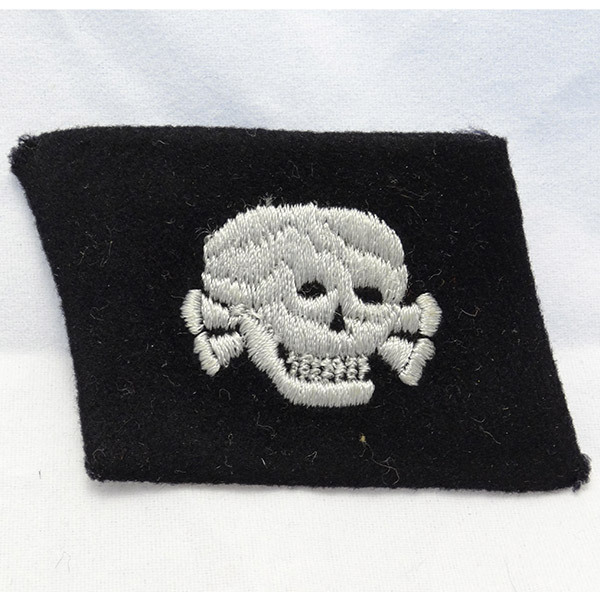 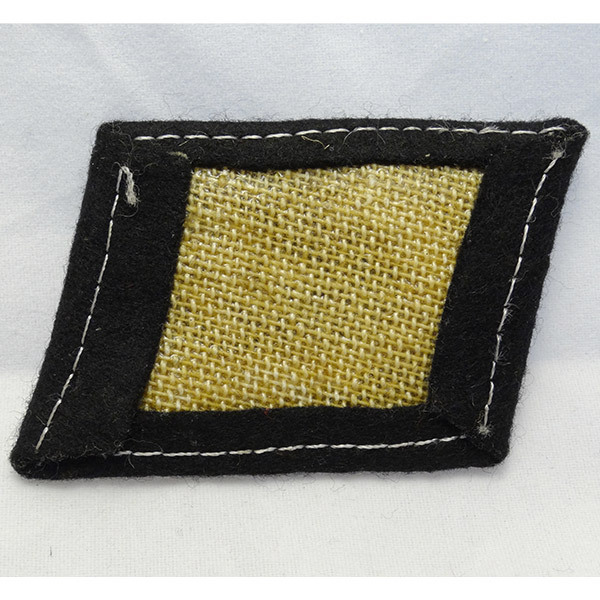 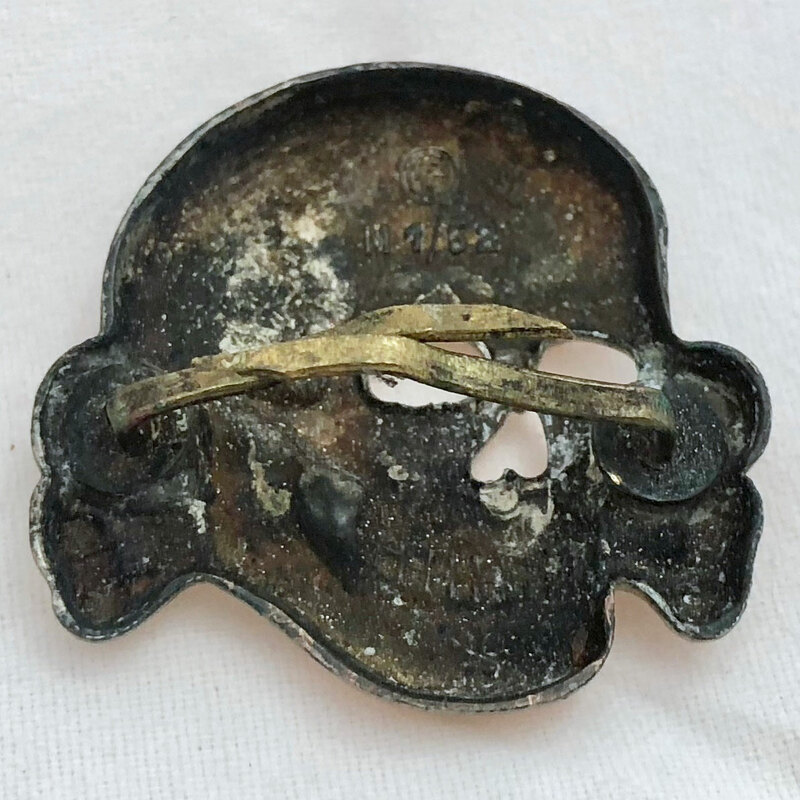 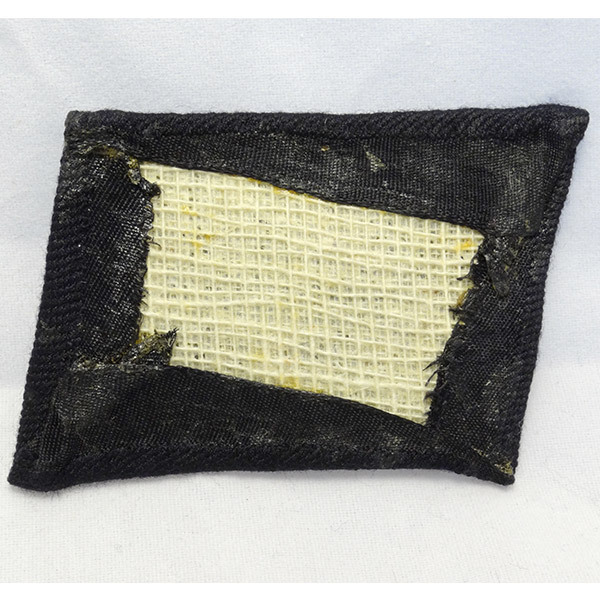 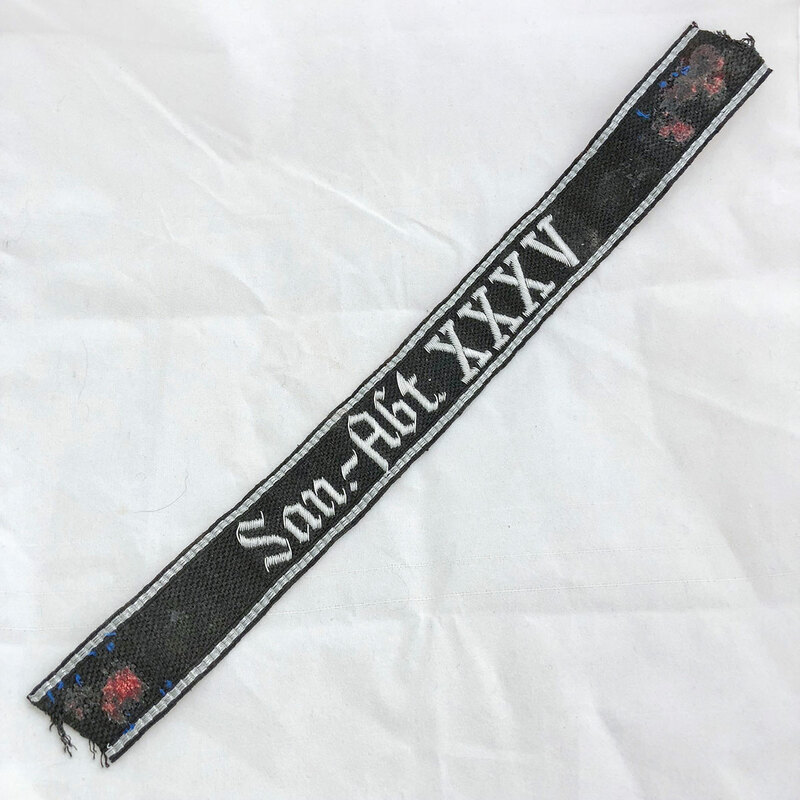 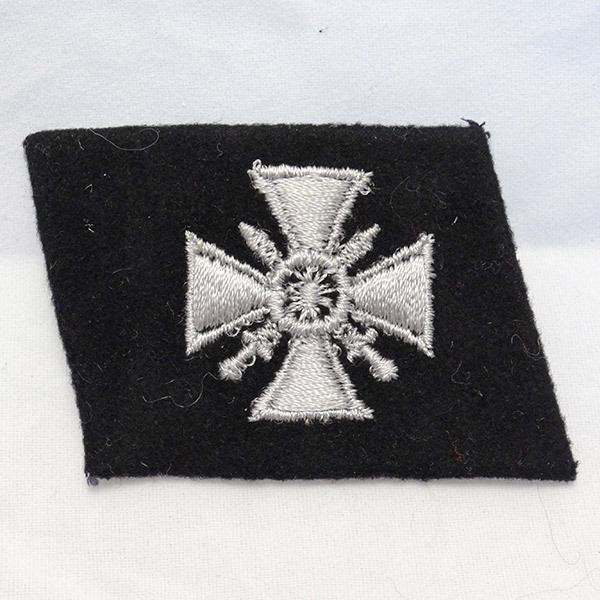 Here’s a nice, minty, unissued SS Totenkopf Skull Collar Tab with the correct silvery-gray embroidered threading applied to a black wool/velveteen backing cloth wrapped and stitched around a buckram stiffener. 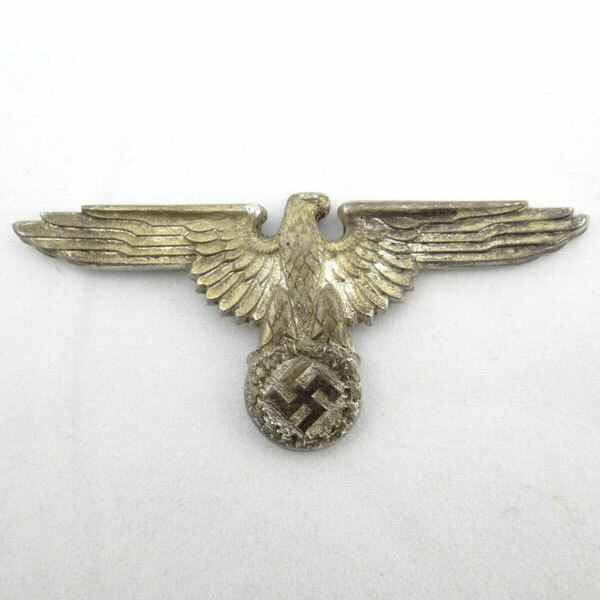 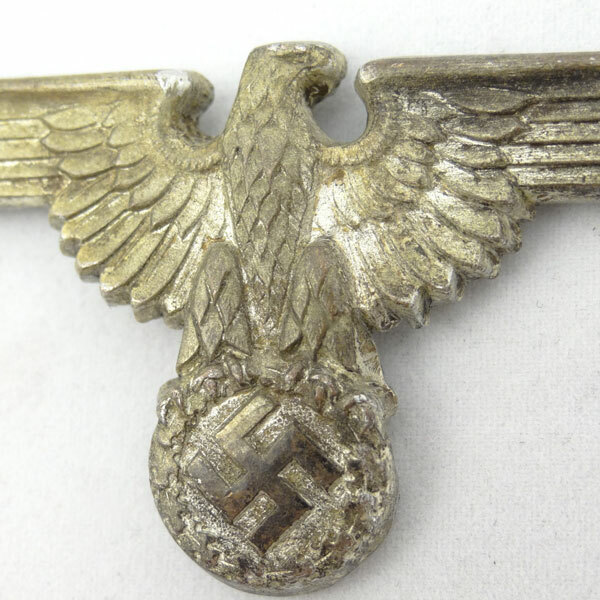 This is the version known to have been manufactured at Dachau, and was acquired directly from the veteran in a lot that includes several other SS insignia (also Dachau manufactured). 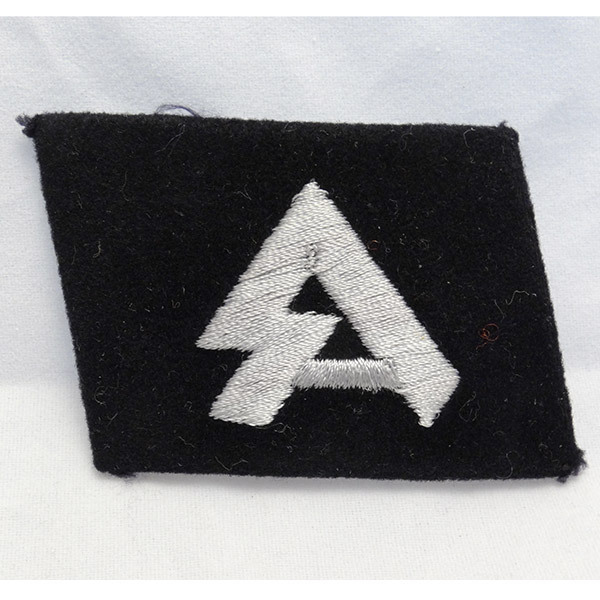 Here’s a nice looking Waffen SS EM/NCO Bevo Runic Collar Tab. 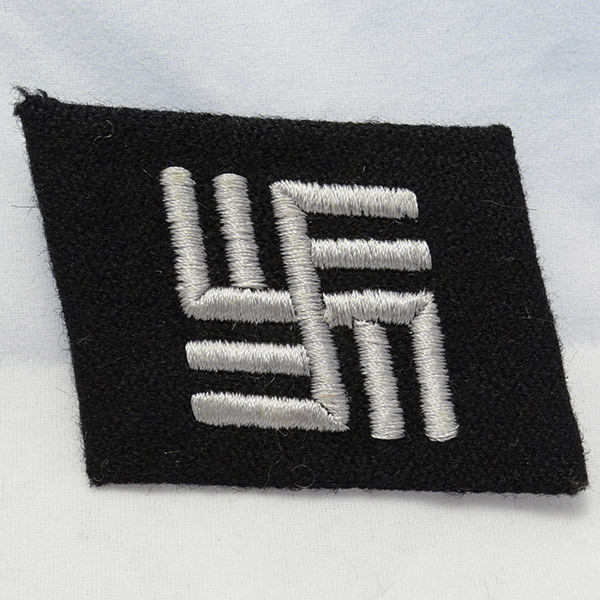 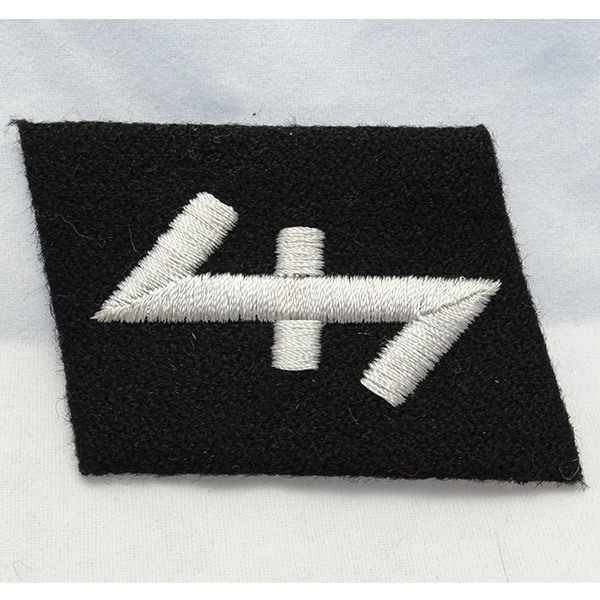 The “SS” runes insignia are a machine woven gray/silver on a rayon ribbed backing cloth. 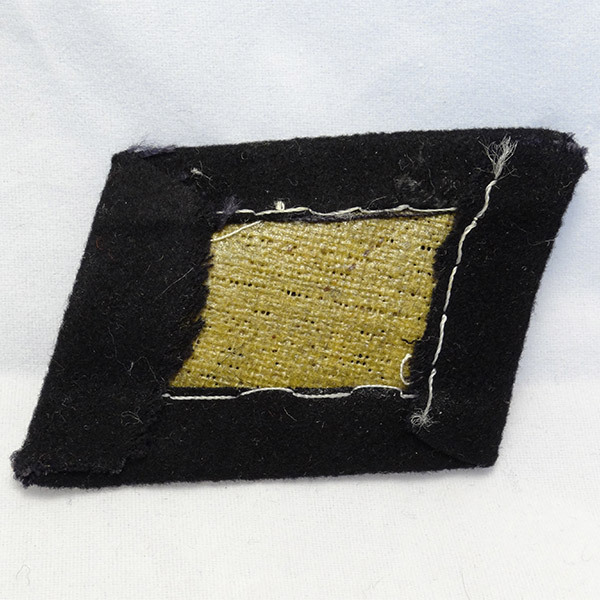 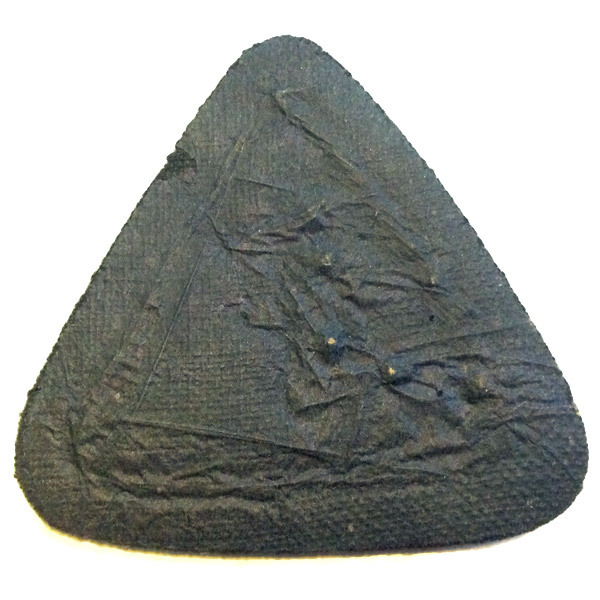 On the reverse we see the correct angled wrapping around a beige buckram stiffener. 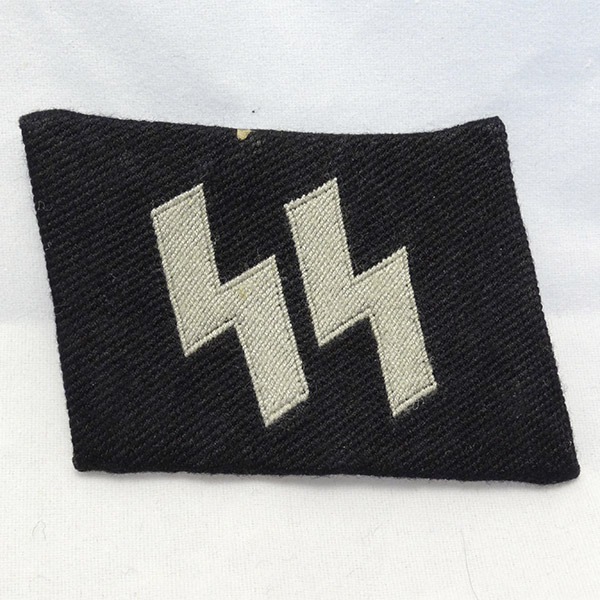 This SS collar tab was acquired directly from the veteran in a lot that includes several other SS insignia (many Dachau manufactured).